A world first on Edinburgh Whisky Blog today! Well, not really. But kind of. 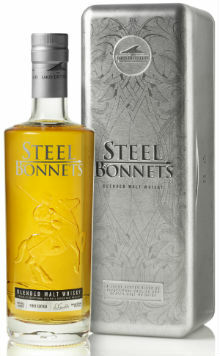 Steel Bonnets is a blended malt with a difference – it’s the first blended malt to be composed of both Scottish and English malt whisky (the English component unsurprisingly comes from the Lakes Distillery). There’s a lot of story and marketing behind this whisky, with the liquid being named after the Border Reivers who roamed the south of the Scotland and northern England from the 13th-17th Centuries. A whole ‘clan map’ and series of ‘clan histories’ are available on the Lakes Distillery website. They’ve really gone to town on the whole clan/family/history/Scotland v England/loyalty/allegiance thing, but for as-near-as-makes-no-difference £65, what do you get for your money? Nose: Initially quite woody, with chewy oak, some woodsmoke, faint clove and some toffee. Then peardrop sweets, lemon bon bons and a some gooseberries. Palate: A peppery spice to begin, then bran flakes, malt biscuits, cinder toffee, melted caramel, drying oak and new leather. There’s some green apples, unripe banana and dusty lemons too. Finish: Drying smoke and oak, with dried fruit mix. Overall: Hmmm. It’s a pleasant whisky, but the oaky and smoky things feel very dominant and the underlying fruit comes across as quite young and not particularly well integrated. I can imagine this style of whisky would appeal to Johnnie Walker drinkers, what with the toffee/caramel notes and the whiff of smoke, but do regular Johnnie Walker Red/Black label drinkers spend £60+ on their bottles? I think not. That’s where I worry for this whisky – it’s not that the liquid is bad, it’s the mismatch between the liquid and the price point. This entry was posted	on Monday, September 24th, 2018 at 9:52 am	and is filed under Reviews. You can follow any responses to this entry through the RSS 2.0 feed. You can leave a response, or trackback from your own site.